Easy to Install:The select number of components included within the kit, ensure that the system is quick and simple to set-up. 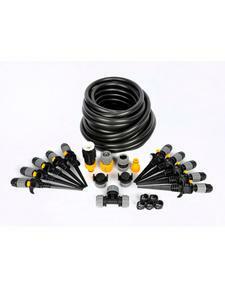 The Flexi Hosecarries water from your tap to the Universal Drippers that can be positioned around your garden. The flexibility of the hose makes installation a breeze; plus the hose can be easily cut to create a layout tailored to your garden. The cleverly engineeredUniversal Dripperscan be easily connected to the Flexi Hose and are designed to deliver water from 0 to 40 litres per hour to the surrounding area. The kit comes with 10 drippers, each capable of watering up to 100cm in diameter therefore providing extensive coverage. Automatic Watering:The kit allows you to add any controller you wish, allowing you to automatically water your garden at a time that is convenient to you. Adding a controller means no more getting up at sunrise or sunset to water your plants and the peace of mind that your plants will remain healthy whilst you are away or on holiday. Modular:The kits are modular in design, which means that if you have a larger space to water you can easily combine a number of Universal Kits to create a larger system. Compatible:Clever design ensures that the Easy Drip range can be used to expand your current set-up or create a new system from scratch. So whether you have an existing Hozelock or 3rdparty system, you can still enjoy the benefits that Easy Drip has to offer. Guarantee:For peace of mind the Universal Kit comes complete with a 2 year guarantee.